Festival Repeat, to Repeat Repeating, Repeatedly by the Dusty Writing Group. Dusty Writing Group with Rosa Johanna and Anastasija Pandilovska and lectures by Dina Danish and Jan Bor. 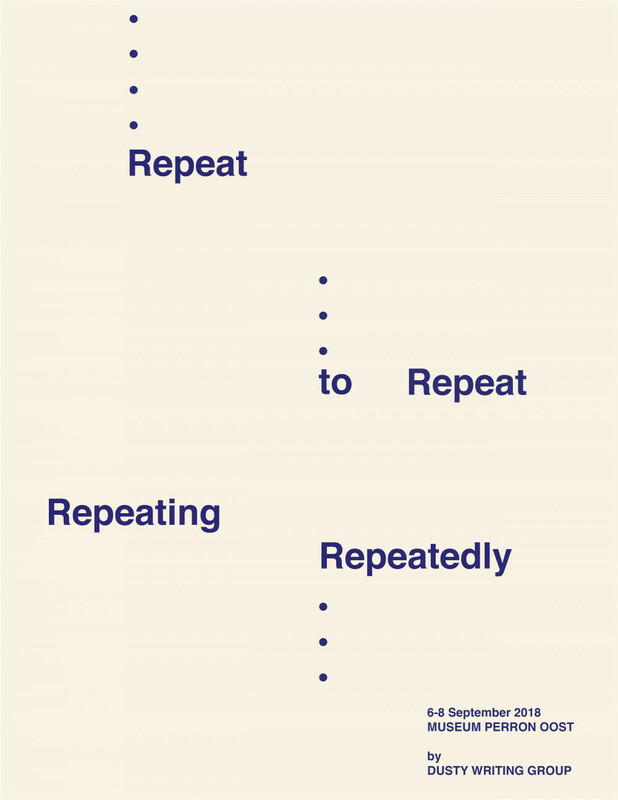 The festival "Repeat, to Repeat Repeating, Repeatedly" is a three-day event organized by the DUSTY WRITING GROUP that will take place at Museum Perron Oost from the 6th until the 8th September. DUSTY WRITING GROUP is a research platform based on the interchangeability or curatorship and artistic practices that focus on unlocking artistic traditions, the multiplicity of contextual spheres and subjecting them to contemporary thinking. The interest is focussed on creating knowledge that shows traditions and contemporary art practices and rediscovering knowledge and methods. The content of the festival will focus on different artistic practices and how they can be interwoven and provide space for discussion and reflection. The start of the festival will include a duo show with new works by Rosa Johanna and Anastasija Pandilovska , a movie screening in collaboration with li-ma.nl, artist talk with Dina Danish and lecture by professor Jan Bor. Both the lecture and the artist talk will be followed with an open discussion in which all participating artist will be invited to join. With the program, the festival aims to further emphasize the dialogue between artists and philosophers. Departing from the collaborative video work Latitude: 52.377219° I Longitude: 4.93873° tthrough which Rosa Johanna and Anastasija Pandilovska in 2017 explored the possibility to construct a broken narrative by concentrating on the notions of repetition and movement, with the festival “Repeat, to Repeat Repeating, Repeatedly” they initiate a further research into the meaning of this notions in relation to the concepts of Time and Space. Approaching this concepts throughout the different days the artists with their own practices will weave in the daily, historicity, intuition, language and humor and explore how those ideas relate to the idea of Time and Space. Parallely, a philosophical framework will be crated questioning the idea of duration and thinking how movement can be dissacosited with time and associated with space. To conclude, together try to think how the Bergsonian concept of qualitative multiplicity which removes juxtaposition can open a way to thinking about a reconception of community. The crowdfunded money will be used for production costs of the exhibition, publication and honorarium for the participants. A sticker especially made for the event and exhibition. A publication especially made for the event and exhibition. A signed publication especially made for the event and exhibition.